The St. Maurice Abbey in Switzerland was originally built next to a cliff for protection, but over the years, it actually sustained considerable damage due to rocks falling on top of it. 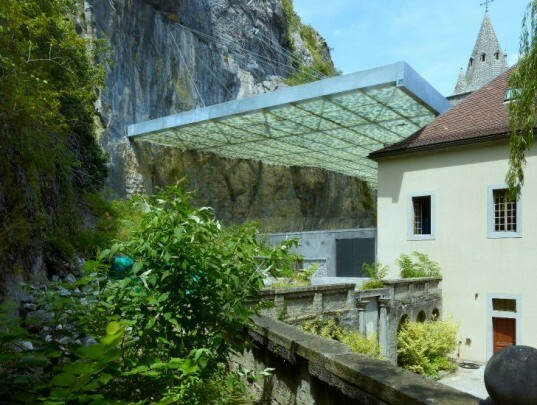 As a way to protect the abbey and its archaeology site, Swiss-based firm Savioz Fabrizzi Architectes designed this dreamy, watercolor floating roof form to protect the area from further rockfall. Anchored into the cliff wall behind the abbey, the roof suspends 170 tons of rock, which serves as a ballast against the wind and creates a dappled shading effect through the translucent material. While very modern, Couverture Ruine Archeologique does not detract from the historic architecture, and instead aims to imbue the space with natural daylight, a contemplative atmosphere and a safe environment free from disaster. The abbey of St. Maurice was built almost 1500 years ago and is situated against a cliff on the road between Geneva and the Simplon Pass. Likely, the cliffside location was chosen because it could be defended easily against invaders. In theory, this was a good plan, but the fortification strategy was hardly a benefit for the abbey in the long run. The cliff often tumbles rocks off its precipice destroying parts of the abbey and marring the site. In 1611, a huge rock fall caused a convulsion of the abbey and then in 1942 a rock destroyed the cross-spire and portal-nave of the building. 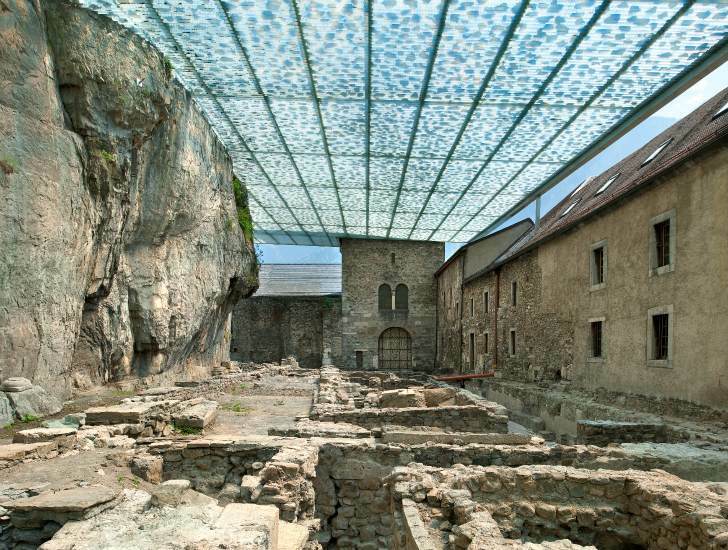 As a way to preserve the abbey and the important archaeologic site below, Savioz Fabrizzi Architectes was tasked with creating a protective covering to hover above the space, but one that would not change the atmosphere. The cantilevered roof is suspended over the space at the height of the abbey’s clay tile roof and just around the bell tower. Anchored into the face of the cliff with three king posts, the roof is able to support 170 tons of rock. The form is composed of a metal form with translucent corrugated paneling and a metal mesh screen on which the rock sits. Sunlight filters down through the rocks and panels creating a dappled effect below. This ambient natural daylighting creates a contemplative space and a comfortable environment in which to work safe from harm. Beautful! It deserve a specific exhibition and why not an international one! The abbey of St. Maurice was built almost 1500 years ago and is situated against a cliff on the road between Geneva and the Simplon Pass. Likely, the cliffside location was chosen because it could be defended easily against invaders. In theory, this was a good plan, but the fortification strategy was hardly a benefit for the abbey in the long run. The cliff often tumbles rocks off its precipice destroying parts of the abbey and marring the site. In 1611, a huge rock fall caused a convulsion of the abbey and then in 1942 a rock destroyed the cross-spire and portal-nave of the building. As a way to preserve the abbey and the important archaeologic site below, Savioz Fabrizzi Architectes were tasked with creating a protective covering to hover above the space, but on that would not change the atmosphere. he cantilevered roof is suspended over the space at the height of the abbey's clay tile roof and just around the bell tower. Anchored into the face of the cliff with three king posts, the roof is able to support 170 tons of rock. The form is composed of a metal from with translucent corrugated paneling and a metal mesh screen on which the rock sits. Site plan of Couverture Ruine Archeologique and St. Maurice's Abbey. Cross section of Couverture Ruine Archeologique at St. Maurice's Abbey. Longitudinal section of Couverture Ruine Archeologique at St. Maurice's Abbey. Top down plan of Couverture Ruine Archeologique at St. Maurice's Abbey.